I took more pictures in Kyoto that anywhere else in Japan (well, at least on this trip). So many that I'm breaking it up into two parts. The weather wasn't really that great when I was there, but I still got a few good pictures, I think. I did horribly abuse the macro taking lots (and lots) of pictures of leaves -- I think I exercised a fair bit of restraint here by holding the total down considerably (relative to how many pictures I actually took of same). 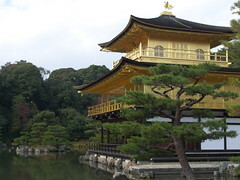 The only actual goal I had when I visited Kyoto was finding the Golden (Screensaver) Pavilion, as featured in my co-worker's screensaver. I succeeded fairly easily there. Other than that, I just pretty much wandered around randomly where I knew there was a reasonable density of temples, sometimes following the crowds, sometimes not. It worked out pretty well for me, as you'll mostly see with the next set. Oh, I was just getting warmed up with the leaves.